**Update: December 27, 2017: Nicholas Chittock, owner of Simply Country feed store, pled no contest to a misdemeanor animal cruelty charge. He is on a year probation, ordered to pay a small amount in fines, and may be required to pay restitution. You can donate to the care of these survivors here. In late October, Animal Place staff received a distressing call about a young piglet being neglected at Simply Country feedstore. 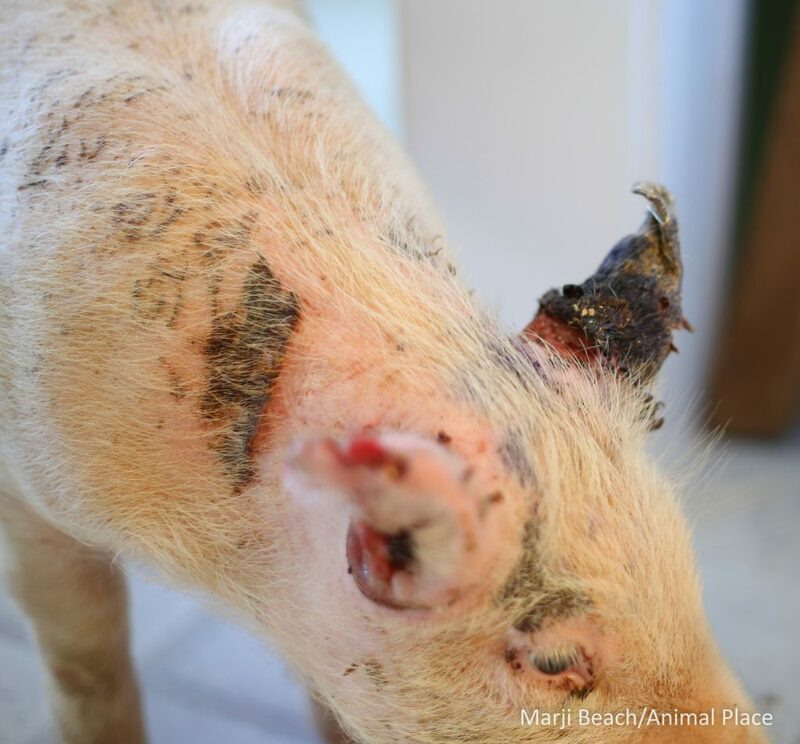 We immediately investigated the call and found an underweight piglet with severely damaged ears and multiple bite wounds across her body, caused by being placed in an overcrowded pen with larger piglets. 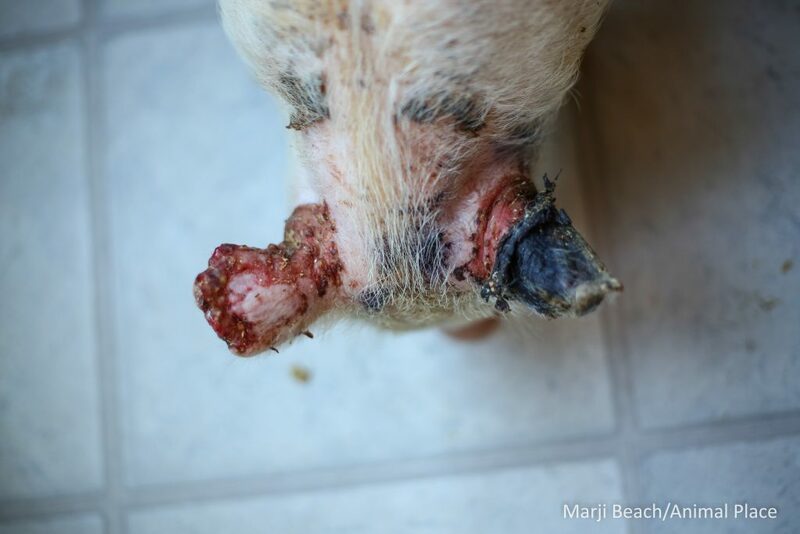 The piglet had not received any appropriate veterinary care and portions of her ears were falling off. Attempts were made to convince the feedstore to relinquish custody to Animal Place, but they were refused. 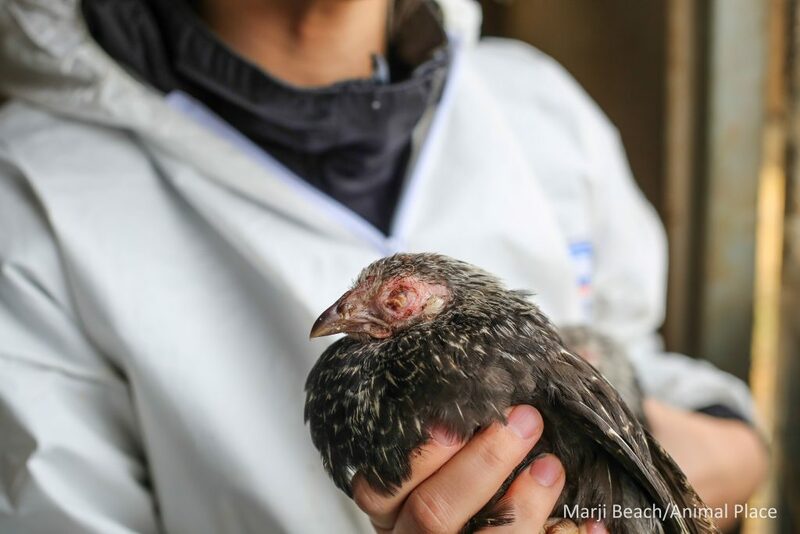 While at the feedstore, we noticed a large number of ill chickens, exhibiting signs of severe respiratory distress. A local neighbor, concerned about the piglet, purchased her and brought her to Animal Place. Our veterinarian ended up partially amputating both ears and treating the piglet, now named Cleo, for puncture wounds. Disturbed by the scene at the feedstore, we contacted Nevada County Animal Control and requested a welfare check on the chickens. Animal control investigated Simply Country feed store and were horrified by what they saw. In the back of the feed store (away from public access) they found 58 dead birds, along with hundreds of other birds in various stages of neglect. Working with Nevada County Animal Control, Animal Place staff aided in the confiscation of 360 birds from Simply Country feed store. All of the birds were brought to Animal Place sanctuary where they will be housed until test results are returned to determine if the birds can be adopted. Unfortunately, these birds may be too ill to be saved and it is possible euthanasia will be the only option. 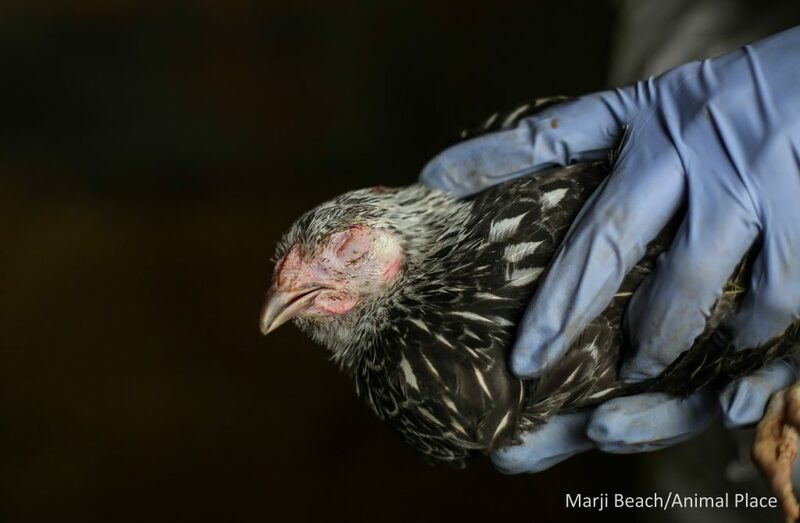 More than 95% of the birds are severely malnourished, despite being housed at a feed store. At least half of the population has some form of respiratory illness that was left untreated. 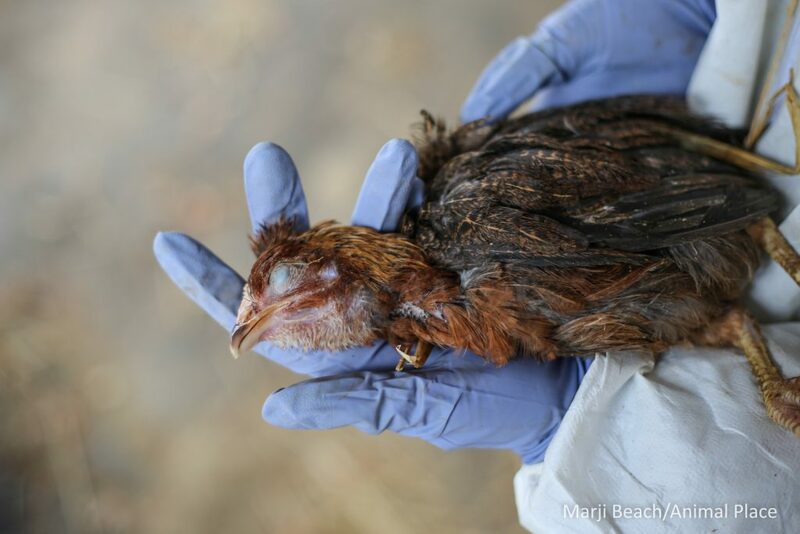 Over the course of four days, 31 birds have passed away or have been euthanized. Criminal charges will be filed with the Nevada County District Attorney’s Office. Farmed animals are protected by California’s state anti-cruelty laws, yet few agencies enforce them. 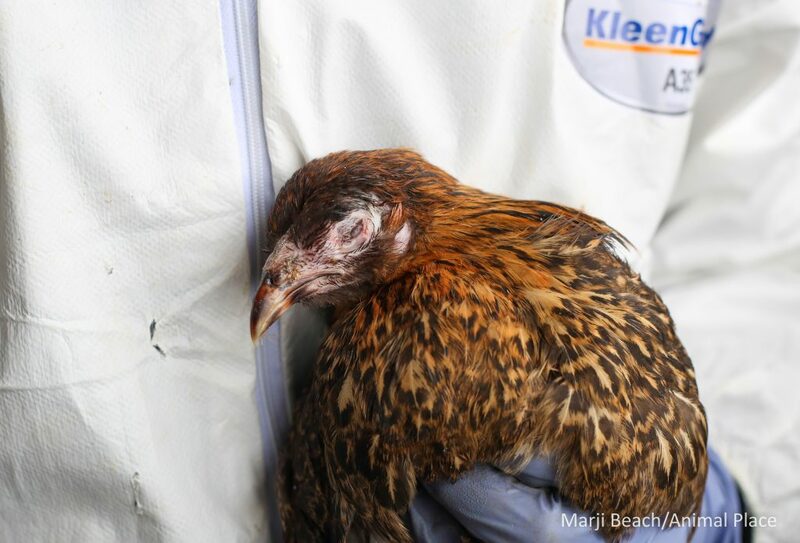 One of the dozens of birds with clearly untreated respiratory illness. Another bird with respiratory illness. She is also severely malnourished. This bird died in our arms, from malnutrition and sudden collapse. I purchased a chicken there a few months ago, and she had respiratory problems. She’s fine now because I treated her. This is just horrible and saddens me. I also noticed that all the chickens home where very dirty as well as the pigs. Thank you for doing what you have done to help them all. We purchased a couple of pullets from them as well. One didn’t make it, broke my daughter’s heart. The other I treated for coccidia and am currently treating her for a respiratory issue. I hope all of these babies get the care and treatment they need and deserve. So very sad. We have a product from Amber Technologies that works extremely well with Coccidia. It is called Kochi Free. It is safe for multi-animal use but I would contact Amber to confirm using the product with chickens. PS – This is absolutely shameful that this is a feed store responsible for taking care of animals. Why did you buy a sick chicken? Ddi the store do anything when you told them you’d bought the chicken and it was sick? I don’t understand how that store could sell any animals, given their condition. This was OK by you? Thank you to the people who pushed this through to the law and the law not ignoring it. This went on way too long, why didn’t anyone check into why these animals were sick? Thank you to those who bought and got them of of their Hell before they died. Prosecute the owners and workers to the full extent of the law(which is less than they deserve) for animal cruelty. You can also add putting human health at risk as these infections very easily could be contagious.That should get some results! What horrible, uncaring people at that store. That is just awful. Those poor birds, etc. That place should be shut down, or at least prevented from having any type of animal in their store. Those poor birds, & the little pig. How sad. I purchased a sick pullet as well. I knew she had respiratory problems but no one would listen to me nor believe me. In the 4 weeks I had her ,her condition worsened. I finally got my family to listen to me. I scheduled a day to get her treated by a family friend. The next day, on Halloween she died. I then found out this whole entire scandal. It sickens me honestly. I hope they ya the very least apologize for this terrible occurrence. Thank you for caring for the animals. How heartbreaking! How can people be so cruel and inhumane? I am sad, shocked and disgusted. I want to think it isn’t true, but that’s not even a possibility apparently. We know the Chittocks well and have for 40 yrs.. My God, how does something like this happen? By people seeing and suspecting but being unwilling to take appropriate action is how this happens. Why don’t you simply ask them why? I am absolutely appalled that this happened in our town. I’m disgusted by this feed store, and I’m very glad those animals are not there anymore. That is flat cruelty!!! Also, a HUGE thank you for taking these suffering animals into your sanctuary! You all have such huge hearts in the right place!! Sending love your way! I stopped buying from there years ago, due to every animal I purchased was ill! Every Time I brought one home I had to doctor it before it would thrive. Add to the fact they way overcharge for products, every small product i.e. dewormer, wound treatment all $3-$4 over any place else. Purchasing Stable Mix not only do they charge $20 bucks more then the better feed store in Penn Valley, but there were numerous times I had to take it back due to Mold. I had started with the Stable Mix as their supposed #1 Hay was always full of weeds, dirt clod and so much bad stuff it was affecting the health of my horse. I wish you had reported them. If people reported negligence and cruelty such as this and demanded action, this problem would be stopped. There should be severe consequences for such mistreatment of animals. Hi Chris: You are more than welcome to – thank you so much! THE FEED STORE MUST BE CLOSED FOR GOOD. THE OWNERS MUST BE ARRESTED, FINED MAXIMUM AMOUNT PLUS PRISON TIME. THIS KIND OF ANIMAL CRUELTY AND ABUSE MUST NEVER BE TOLERATED IN OUR SOCIETY. But animal cruelty – globally- is not only tolerated, it is encouraged by all the carnivores who think when they’re shopping in the “meat “ department for their constant avid consumption of burgers, chicken, pulled pork, they’re not shopping in the “animal” department. Personalities on the Plate. There are many books out about animals, cruelty, poaching, canned hunting, massive abuse and animal suffering. If everyone could just eat meat once a week or once a month, we could end agribusiness monopoly on cruelty. Re this feed store: they need to be closed and prosecuted, to the full extent of the laws, both state and federal. Food network’s glorification of animal cooking isn’t helping. Everything u say is absolutely right but this is California where they have anti’cruelty laws. if this feed store cant be prosecuted CA & not allowed to harbor live animals anymore after finally being exposed, how does it bode well for anywhere else? The most dangerous speice that walks this earth are humans. Earth is Hell for the majority of all animals. I just hope and pray that the animals that haven’t been discover that they’ll Never ever be discovered. People now these days have No compassion for animals when they also have feelings. Farm animals are the forgotten animals. I stop eating animals because I love them all. I would agree with you except for the fact that I JUST returned from a week volunteering at the Best Friends Animal Sanctuary in Utah. This was my 6th visit. This place renews my faith in humanity. It is a place of peace, compassion, positivity and redemption for thousands of animals (currently 400 dogs, 600 cats, 44 hourses as well as a meangerie of goats, pigs, parrots and animals at their wildlife rehabilitation center. There are two worlds . . . the world most of us live in and the world at Best Friends. I would highly recommend that you visit. It is a place of renewal for me. You don’t need to go to Utah to restore your faith in humanity (although I’m certainly not discouraging it, Best Friends is awesome), you just need to go online and google “animal rehabilitation near me”. I guarantee that you will find either a dog or cat rescue, and quite possibly a wildlife rehabilitator or farm sanctuary within driving distance. Call them, tell them you want to help. Ask if they need supplies (they will) or donations (definitely). Ask if you can volunteer once a week, once a month, etc. THERE ARE good people out there, giving all they can to these animals that have been so severely let down by humans. You can be part of the solution if you want. Sylvia, you make no sense. first you say you are very dangerous, then you say its hell for most animals. What animals are you talking about ? What people are you talking about ? when you say people, were all people and i would say most of us do have compassion for animals, people, and just about anything you can think of. Farm animals are the forgotten animals ? What happen to majority of animals its hell ? Farm animals are not the majority and you stopped eating animals and all is ok now ? What if the Chittocks say a mistake was made with the pig and it will never happen again ? Everyone deserves the right to correct their mistakes and make things better just as you have stopped eating meat because of your love for animals. what happen to the little pig could have happened over night just by being in a pen with larger ones. 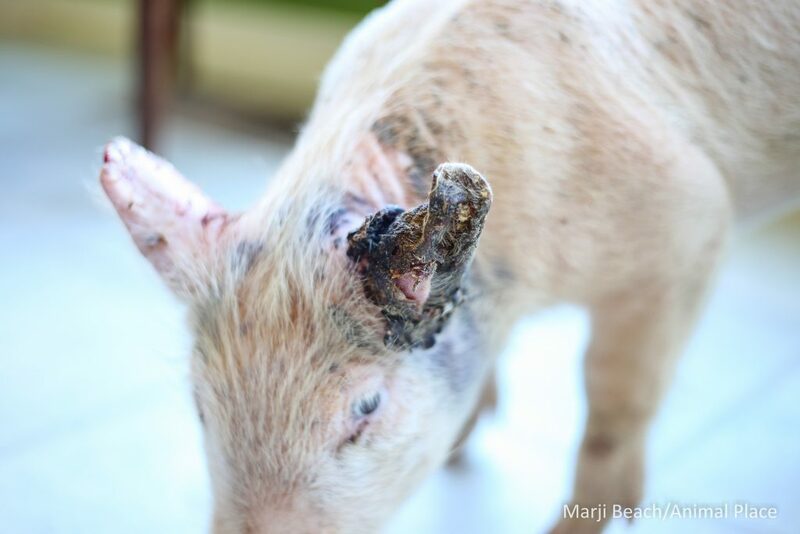 The fact remains that the pig was not provided veterinary care, much of her ears have had to be amputated, and that does not explain the poor health condition of the 300+ chickens we took in. We certainly hope that Mr. Chittock continues operating his business and charitable work, but without selling live animals. marc, who are ‘the Chittocks’ who ‘may have made mistake’ to put a little pig in a pen to be defenseless against being abused by larger pigs? Means no one ever has to take responsibility for anything they do just by saying it was a mistake? That doesn’t fly when you’re causing suffering to another living being that you wouldn’t want to have to suffer yourself. People who have the ‘same empathy’ for little pigs as they have for Chittocks don’t talk like this. Thanks Animal Place to all of your wonderful volunteers for the life saving work that they do each day. You are truly angels on earth, and are doing God’s work as stewards of His creatures. Please know that you are highly valued for your compassion and courage, and are heroes. Why isn’t this place closed down or at least banned from ever dealing in live animals ever again. Please don’t let them get away with this horrible, cruel treatment .Hope they get a very severe penalty and should never be allowed to be involved with animals again. Horrible, disgusting people. Not worth the air they breath or the space they take up.. I so agree with most who have left comments and also agree with Carolyn Denton. The Feed place MUST BE SHUT DOWN AND NEVER ALLOWED AGAIN TO BE INVOLVED WITH ANIMALS. Places like this need to be closed down and the people running it need to go to jail and pay stiff fines. They are obviously not in the least bit concerned for the welfare of the animals. It saddens me to see these animals that have suffered terribly. put the people that did this to these poor innocent creatures in Jail and starve them. They deserve no mercy. Thanks for helping these angels. Sorry not all could be saved but they are in peace. Sending positive thoughts, get well wishes and prayers . Thanks for your good work! I hope the law puts them out of business to protect animals and the public. Thanks for the good work that you all do. If the problem was one of overcrowding and no place to extend, before animals become desperate, why do the people not ask for help? Is it not reasonable to either not keep so many or go to a source that could help? What am I missing here? Why waste animals’ live s and cause them to die? That is wicked and wanton disregard for a problem that could be solved. 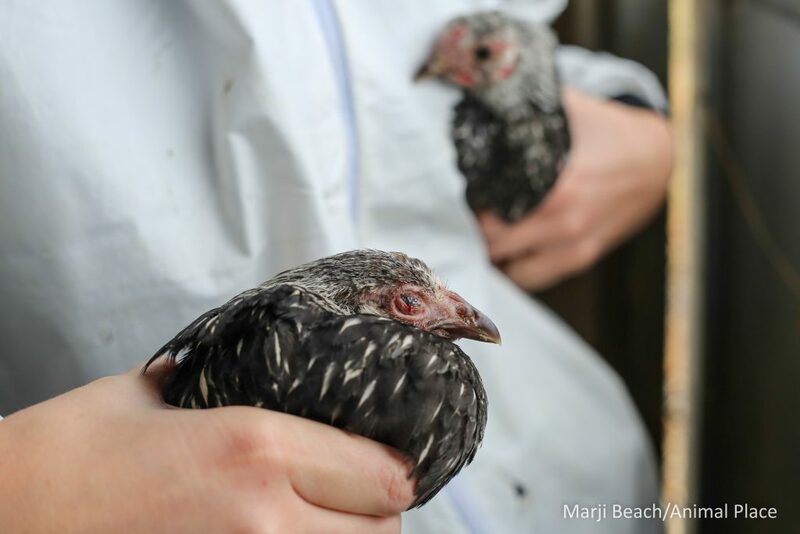 How did so many see the problems and get animals that were ill without reporting it sooner? That little piglet didn’t get that way overnight! Why does it have to reach this level before someone has the balls to turn people in who treat animals in such a horrible way? How much do people think an animal has to suffer before stopping human abusive behavior such as this? Evidently a lot. Sad. I honestly believe that harming or mistreating those weaker than ourselves or those in our care is the greatest evil humans can commit. I really hope that those responsible for this travesty at the food store are punished both in this life and the afterlife. We the people of America need to band together and do everything in our power to make sure NO! animals, wildlife, bird life, sea life, or plant life get abused, killed, exploited, or put through any of this hell that all animals or put through here in America every minute of the day. Please, people, I beg all of you to take a stand, raise your voices, and take your power back from these abusive Corporations, Governments, factories, farms, and pet stores. Fight hard, save and protect innocent lives. thank you for your message, worded so well!!! Absolutely agree. It saddens me to hear these horrific stories.That’s why donating to animal welfare organizations like Animal Place is worth every dollar. Let’s keep fighting for the animals! I could not agree with Brian Girard more. He said it all. What part of HUMANE is missing with so many humans? It is really sickening the lack of regard for life and the apathy toward living things suffering. We have to make changes and fast. Is there a group called Legal Defense for Animals? There once was such. If they are still in existence we need to contact them and get them on such a pitiful and disgusting discovery. It is beyond my comprehension how any (?thinking), feeling human could possibly do such a thing. Little by little, the world will become vegan and humane. One person at a time. The authorities should be turned over to a HIGHER AUTHORITY – In other words – they should be shut down – think of that what you will but what I don’t understand is what kind of people allow others to be so abusive over such a long time that animals show evidence of cruelty and no one does anything about it! Thank you, so much, for coming to rescue of these poor animals. How can people be so cruel? It never ceases to tick me off how animal abuse just seems to be getting worse. Everybody needs to step up to stop this cruelty! Heartbreaking — make these idiot-owners accountable for their crimes — CRIMES AGAINST ANIMALS MUST BE TAKEN SERIOUSLY — SHUT DOWN this store– the depraved indifference to the suffering inflicted on these innocent & vulnerable animals is telling of cruel, unconscionable, merciless, sadistic, cowardly humans — they look to gain on the backs of animals, who are always at our mercy — PUNISHMENT & PENALTIES MUST BE SEVERE — WHY would a rational & compassionate society allow for the abuse, negligence & death of animals — SHUT DOWN THIS BUSINESS! Couldn’t agree with you more, MS. Thank you, Animal Place, for uncovering this, taking in and treating these poor souls and for pressing for justice. AMEN, CLOSE THIS BUSINESS AND A LAWSUIT NEEDS TO FOLLOW!!! It’s still nice to know that there is people like Animal Place out there that care for the poor and defenseless. This would be such a better place if we all had it in our hearts to help these animals that cannot speak for them selves. May you all have a place in Heaven for your kind hearts. Thank goodness someone finally noticed this horrific situation. NO excuse ever for animal neglect or cheating the public on goods sold. Animals and birds should never be mistreated ever!!!!! Thank you however you are for getting problem recognized and delt with. The people who own this company should pay a HEFT FINE and never be aloud to operate again!!!!!!!!! Thank you so much for what you are doing. Is it possible this place will be forced to close? I also give to ALDF. It’s in Cotati, California. The name of the organization is the Animal Legal Defense Fund. They may be able to help. This human beings (cough!) should not be able to have anything to do with animals ever again – even to the extent their store should be closed. Dispicable! Simply Country Feedstore , where these poor animals were kept, should lose their license and go to jail!!! They did nothing to keep the animals safe, healthy, or alive!!! It appears that these people let the animals suffer and languish!! It is very disgusting and inhumane what these people in charge of Feed Store and all animals did! These poor animals were exploited, uncared for!! The animals greatly suffered, and died! Let these peplle feel the suffering!!!! Thank you for rescuing these babies and getting them out. After being caught up in anger against these abusers, I didn’t mean to forget to thank Animal Place, immensely, for all the wonderful work that they do. Farm animals really need caring saviors like this kind rescue organization! They need and deserve humane empathetic treatment–as much as ANY other living creature. I am so happy to see there are organizations that care so much for abuse animals, thank you so much for people like you. Blessing to all who helped. This story is heartbreaking but amazing. Thank you Animal Place. Thank you so much for stepping up and saving these animals and birds. You are true heroes and angels for what you have done to save them. Thanks again.!! As a former flock keeper and owner of lap-sitting chickens that preened my hair and at the same time clucked sweet nothings in my ears, (phew), I am truly appalled at the criminal neglect shown by the owners and employees of that store. They should definitely see jail time! I hope those animals find the rest of their lives as happy and rewarding as possible. No animal should have to endure neglect and abuse. There needs to be stiff penalties to those that harbor animals without proper care. All animals that rely on a caregiver should never have to die from torture. Good thing I don’t live in California…The owner might get a taste of their own medicine…;) Yes, it is a threat. Please tell us these people are being prosecuted for this obvious abuse of animals?! This just can’t go away!!! ALL animal abusers deserve prison time. What the hell is wrong with people? When are Federal animal cruelty laws going to be strictly enforced with fines and imprisonment? How can people who see these chickens and the piglet not know that they were ill.
I’m so sorry for the animals that were treated so badly. Thanks to animal control and to animal place. Thank you for saving these poor animals. The people at the feed store should be prosecuted to the full extent of the law. Disgusting and inhumane. This is so wrong and I am glad this torture of innocent animals was detected and remedied to the degree possible. How many go undetected? The great majority of such neglect and abuse for sure. That is the most disgusting situation I have heard of and feel that person running that place should be prsecuted and the place closed down. That kind of cruel treatment of any animal shouldn’t be tolerated. Someone asked “How does this happen?” It happens because those that become aware fail to do something. Thank God for those who intercede. The inhumane breaches happen all over the U.S. and, In fact, all over the world. We all need to step up even if only one situation at a time. The Animal Kingdom deserves so much more. Big Ag and small suppliers should be ashamed and we, the little guys, need to hold them accountable. This will not happen without these types of situations being exposed….even if one at a time. This really sickens and angers me so much. I applaud your work and how the disgraceful Feed Store owners are both punished and also required to get remedial education in animal care and treatment for a good year, to be allowed to even keep their business open. Unfit businesses like these need to be, MUST, be shut down and NEVER, EVER again be allowed to open again. They also must have abd deserve LONG PRISON time for their neglect and offenses. This is NOT the way America must take care of ALL animals in our care. God bless the caregivers and rescuers. God forgive the abusers but please make them stop! I am reading the comments and I am astonished of how many people new this place and how bad the birds were but they still purchased their animals from this feed store and did nothing to help those innocent lives !! Thank god this good hearted man bought this pig . Animal place what you all did is just amazing , you are definetely on my list for Christmas this year. We all need to denonciate , call , complain when we see abuse !! It’s easy to look away and do nothing . I trapped feral cats in my neighborhood , they are not mine but again irresponsable owners don’t care and we end up with hundreds of strays fending for themselves . I pay out of my pocket just to help them ! I have cooler boxes , feed them outside ..so next time you see something that looks like cruelty make a phone call ..
You are welcome !! We all need to make a difference every day in a world where animals are discarded like trash . They breath , and feel pain just like us. This feed store should be cited and shut down. Thank you for saving what lives you could. Sad. What took Nevada so long to go after that Feed Store. Why couldn’t they force the store to give them those animals under those conditions? You can take those animals away from people when not a Feed Store. They should be shut down. That is so sick I just couldn’t look at those pictures. I wanted to confront those people myself. My heart breaks for those animals. Why can’t the authorities do something? I don’t believe that they can’t and that they waited so long. That store needs to be shut down and those people need heavy fines and prison. Do your jobs. These perpetrators should be ashamed of themselves…..obviously they have no feelings for ANY critters, and likely have no conscience whatsoever. There are no words to remedy what they have already done. The damage is done. Hopefully the good Lord will treat them justly when their time comes…….perhaps he’ll turn THEM into chickens when their time comes…..or worse. When I received this e-mail, I just couldn’t understand why neglect is so much in this world with animals. Maybe I’m not saying this right and I don’t want to get any one upset but this is something that needs to stop. I just cried when I saw that little piglets ears and those birds also. I thank you from the bottom of my heart what it is that you do and continue doing for these animals. I am beyond grateful for Animal Place. You welcome all these animals and love and care for them. I don’t know how anyone could harm animals like this (or worse). Kiss that little piglet for me, and those poor chickens! I hope someday to come visit, but for now I’ll donate. Shocked that this happened thank you to everyone who stopped this crime that should be shut down and never allowed to have any animals or birds ever or be in a business that has to do with animals ever plus a nice jail sentence and high fines. The authorities should fine the owners and staff for doing absolutely nothing to care for those poor animals! Totally disgusting and should be addressed!!! Thank you for your work. I hope you wil poast pictures of birds that recovered and the healed up ears and other injuries for the little pig. The store should be closed down, the owners and if not jailed, at least fined. Thank God for you people helping these animals. Some people are so cruel. I reporterd a animal store who sold dogs , cats , birds and reptiles to animal conrtol in our community about the dirty, bugs infested place. It was overcrowded in these cages and verything was dirty. I do believe they did something. Guess what I believe its time to check this place out again. One good thing is that these animals will have a better life now. This heinous cruelty needs to be punished by doing SERIOUS time in PRISON and MONETARY FINES!!! Cruelty like this MUST BE PUNISHED in ways that they won’t forget or they will do it again and again! This EXTREME CRUELTY WAS done by a monster! Letting him or them go with a slap on the wrist will only make them do WORSE to their next victims! I say fine them HIGH fines and give them time in prison -HARD TIME. These store owners need to be held accoutable and fined. They also need to be shut down. Jail time is not a bad idea either! If they ate allowed to stay in business they need to be monitored dsily and shamed publically for their past conduct! Also, they need to pay for the medical services any sick animals have received that were confinstated from them. The expense should be huge! Horrible human beings! Country Feed Store, Is that their name? Simply Country feedstore in Penn, California. They should leave a comment here to explain how they managed to be so neglectful and criminal to the animals in their care. I am going to google them to see of they are still in business? Thank you Animal Place for helping these animals and for all the other caring people here. Thank you for helping these poor animals. I only hope Karma steps in on the horrible excuse for humans. Well, this feed store is yet another sad example of just how man proves over and over how he is the most inhumane living thing on this planet. So happy to hear that actual charges will be filed. This is animal cruelty and the people should be punished for this and their place should be shut down. Report this as unhealthy for humans (all the infections and respiratory distress!) and that will get some results! Thank you to those who finally reported it and got the law out there-probably two days too late for some of the animals. Thank you to law enforcement for taking action.Thank you to Animal Place for being there.I hope the community will help pay the expense in saving these animals. The owners and workers need to be prosecuted for animal cruelty to the full extent (which is nothing near what they REALLY deserve)and get prison time. People come forward and let the law know how long this has been going on and give your horror stories. Country Feed Store’s website is still up. How fraudulent they are in describing their history, a family business? In the business of animal neglect? Apparently the grandkids who are now continuing the legacy or has it been going on for awhile, unbeknownst to the general public but discovered just recently because the staff got careless AND someone noticed? Here’s an excerpt from their website. Grandson Nic loves what he does? Animal cruelty? This entire thing needs to get exposed in the local newspaper/media if it hasn’t yet. Thank you Animal Control and Animal Place. I visit Animal Place when I can and donate too – look forward to seeing Cleo when she recovers. Why are the owners not being prosecuted? The fact that they refused to surrender the piglet for treatment is cause enough alone. They obviously have a total disregard for animals. This has been going on for years!!! 8-9 years ago I bought 24 chicks from them. They all ended up having a respiratory type disease. They all started slowly dying. I contacted the store and they did nothing. I took some of the dead birds to UC Davis for testing. It was more than just a disease, it was a type of toxicity from the feed the store makes, if I remember right. You might be able to get more info from UC Davis. Some of the chickens made it but most died. There’s more to this story! I am not understanding why anyone would purchase a chicken in the first place when they can adopt one needing a good home from a rescue. And then as pointed out by a number of people here, why was the neglect at this feed store not reported earlier? Why in the world is this place even allowed to sell animal feed if they can’t even care for the animals they sell! This is totally absurd. These people need to be locked up and put away for good. It’s so unfortunate that there are people out there with the mentality that animals are not worthy of the basics to survive. It’s bad enough that they have to be eaten, but to be tortured along the way is what needs to stop. I wish I could stop people from even eating any animal. A plant-based diet is proven to be a much healthier route. If we all did it, the planet would be healthier for it and animals would not be brought into this world just to die! I am glad someone bought Cleo and gave her a home. I believed that the animals were kept in such horrible conditions is for Money.The feedstore owners in the BUSINESS OF MAKING MONEY OFF OF SELLING ANIMALS, then of course you want to make the “biggest” profit right. Vet care would cost MORE THAN what the animals would sell for. So DON’T BUY ANIMALS. We never morally had the right to STEAL LIVES and sell them. We gave ourself that LEGAL RIGHT. Thank you for all you do for all the very beautiful animals. I firmly believe humans are jealous of the nonhuman beings. They wish they could be as wonderful of all the animals on earth. Do courts ever impose the costs associated w/ rescue, care & rehab of abused animals onto the person convicted of responsibility for the abuse? Taking ones time to write & submit a comment, which is then not printed reg an animal abuse case, is frustrating & makes one feel hesitant about wanting to donate to Animal Place. Animal Place is a tax-exempt non-profit, federal EIN #68-0200668.